Hey everyone! It's almost the end of the week, just one more final hurdle and we'll have reached the weekend. I've got lots of birthdays this weekend (sister, mum and grandma), and it's fathers day too, so not only am I busy, I'm also poor! It'll be nice to have a meal with the family though, and eat cake. Diets have to go out of the window when there are so many birthdays to celebrate. Anyway, it's been a while since I did a Throwback Thursday post, despite the fact I've actually had these images for well over 2 months. Thursdays just seem to pass me by, and suddenly it's Friday and I have missed the day to post once again, but this week I finally remembered! 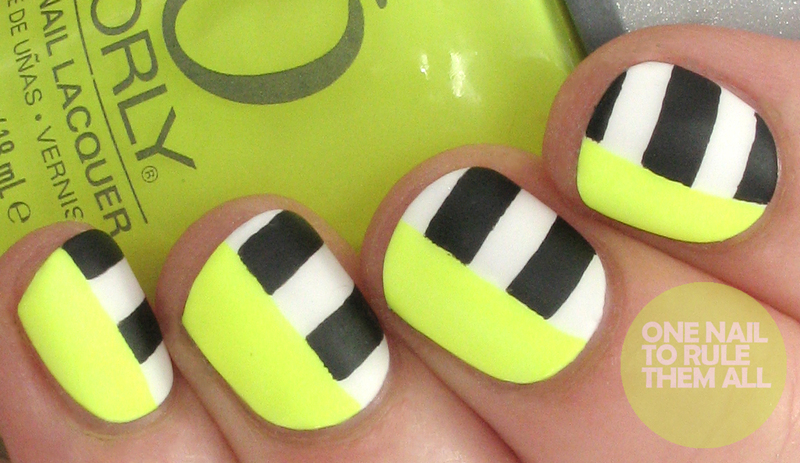 This was the original post for these nails, which I did for the 31 Day Nail Art Challenge back in 2012. They ended up being quite popular, which I wasn't expecting, and a few years later I recreated them in pink here. But I wanted to go back to my original design and give it a new lease of life. The first time around I remember waiting hours and hours for tape to dry and getting frustrated at how messy it was. This time around Seche Vite was my friend, and so was liquid palisade, which made it a lot easier and a lot quicker to do. I did unfortunately find that my lightbox washed out the neon quite a lot, but it is still the same shade I used in the original design: Orly - Glowstick. I wish it had picked up the colour better as it ruins the pictures a lot. Apart from the nail length difference, I actually think my original design wasn't too bad and so there's not that much difference between them, except the photography. I also clearly hadn't quite mastered the claw hand pose at this point! 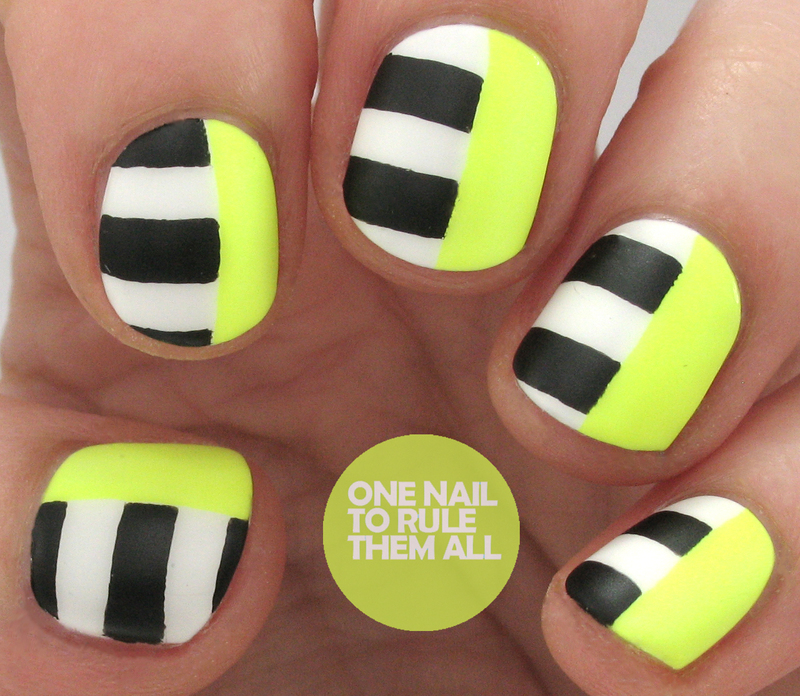 Woah, it's bright & bold and I love the black and white stripes with it. These look gorgeous Alice! 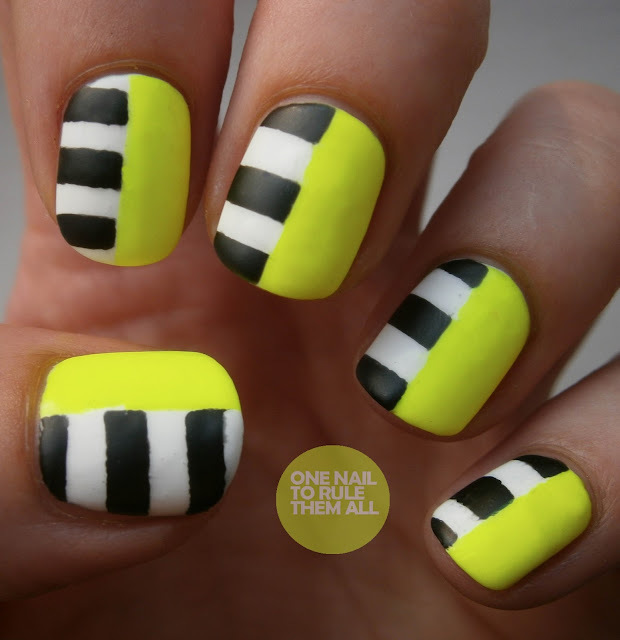 I love the neon yellow and b/w mix. Super bold and fun and what great progress you made after 4 years. Ahhh I freakin love these!! Gorgeous design! I love the crazy bright neon! Although this is a simple design (you know, I love simple!) it is so striking! Wow, I love this color combination and the simplicity of the design. Both versions are gorgeous and your photography has improved so much, it's always nice to see the difference. I absolutely love these neon stripes! Your nail design resembles me the one I've seen on http://nailartstyle.com/top-70-colorful-nail-designs website. I've recently got neon nails with a glitter accent. Looks great too!